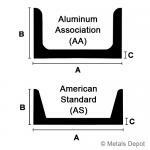 6061 Aluminum Channel, aka Structural Aluminum "C" Channel is an extruded aluminum product with inside radius corners that is intended for all structural applications where greater strength is required. 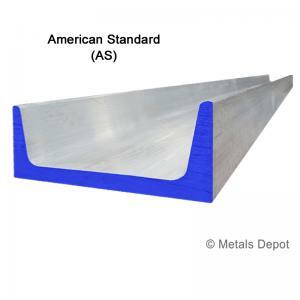 6061 Aluminum Channel is widely used for all types of fabrication projects where lightweight and corrosion resistance is a concern - frame work, braces, supports, trailers, truck beds, etc. 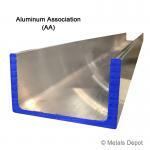 Metals Depot stocks hundreds of sizes of aluminum channel that you can buy online in ready to ship precut or mill lengths or order just what you need custom Cut to Size in small or large quantity at wholesale prices. 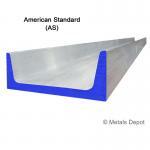 Available in (AA) Aluminum Association and (AS) American Standard profiles. Provided in raw mill finish, not intended for cosmetic applications. Select ... 12 Ft. 25 Ft.